If your last plane flight left you feeling like a sardine in a can, this news is going to make your day. Italian seat manufacturer Aviointeriors has designed a seat that gives you plenty of room to stretch your legs out, even if you are taller than average. There’s just one little catch – you have to fly basically standing up. The SkyRider 2.0 solves two problems for airlines: it lets them pack in more passengers and it gives those passengers more leg room. The seats are connected to the ceiling and floor by a bar and they have a vaguely saddle-like seat that holds the rider in an upright position. The previous SkyRider had a very saddle-like seat, which Aviointeriors claimed was comfortable because cowboys could ride in the saddle for hours without discomfort (a notion that any novice horse rider would find laughable) but the FAA didn’t approve the design. The new and improved version has more padding and a more comfortable seat design. The seats are being billed as an option for short-haul flights to allow airlines to reach an “ultra-high density” (ugh) of passengers on each flight. 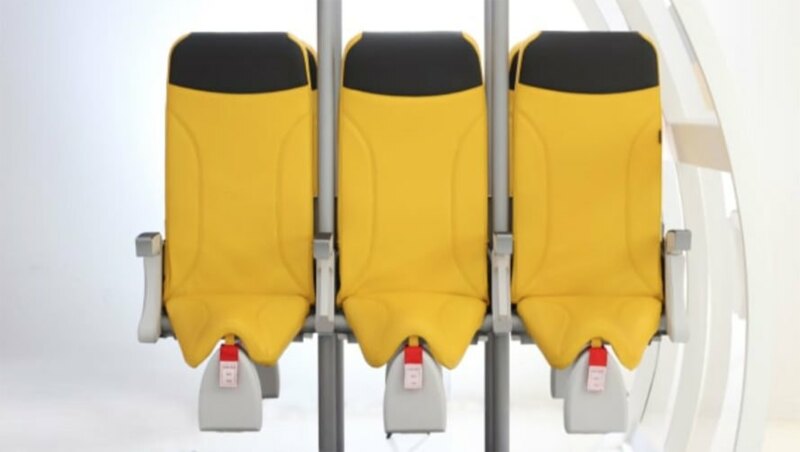 No word yet on what actual human beings think about being strapped into one of the SkyRider 2.0 seats for several hours – or if any airline will buy them.